My other D6 Games Buffy D6: boyfriends, bad grades, Apocalypse on a weekly basis. Try life in the world of Buffy the Vampire Slayer. Neverwhere D6: magic, mystery, and sewer tunnels. Try survival in the Underside of Neil Gaiman's Neverwhere. Starcraft D6: fight for the future of your species in an rpg based on the best-selling computer game Starcraft. Welcome to the Appleseed D6 Game! 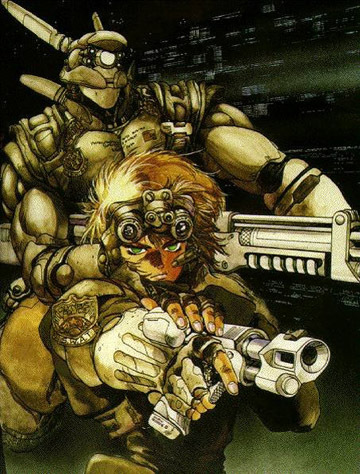 This is a role-playing game is set in the world of Masamune Shirow's classic cyberpunk series Appleseed, one of the best manga series ever to be translated into English. The game mechanics are based on West End Game's D6 Legend system. If you haven't done it yet, go out and buy just about everything by Shirow you can find. While you're at it, check out the WEG's products, which you'll likely need to fill in a number of gaps in these pages. The events of Appleseed take place after a great world war. Though nuclear weapons were never used, massive biological weapons were let loose upon the world. Advanced technologies were used to destroy most centers of civilization. As the old nations attempt to rebuild, a new power, called Olympus, stands out as the most technologically advanced and civilized nation on the planet. Populated mainly by genetically engineered bioroids, who many consider to be the next step in human evolution, Olympus purports to exist to safeguard and guide mankind. But political alliances and true motivations remain obscured. The country is rich with surprises, intrigue, and danger. Read about Olympus and the State of the World (written by Dave, who has an excellent Appleseed sourcebook for the Fuzion system). BIG NEWS (relatively): I completely changed the damage system so that now players roll the dice and sum their value to get the damage result. I've also adjusted some equipment, skills and armor values to keep everything more balanced (I hope!). I posted my best guess for game stats for Deunan and Bri in the first Appendix, called Series Characters. I will add more (like Hitomi, Yoshi, Magnus, Artemis, and Fang soon). Minor corrections and additions to Skills, including a new table for Jumping attempts. My counter went all funky. It does this when I work on this page while still online. Anyone know how to solve it? Anyone got a better counter? If so, let me know. Like most things, this is game is a work in progress. In the next few months I will be adding more pictures (I'm not at home right now and left my CD full of Appleseed scans there! ), a PDF version of the rules, and hopefully some fixes and additions to what's presented here. Check back soon!